1. Wash wax gourd, peel, gut and cut to 1.5x1.5 inch. pieces. 2. Remain mushroom in water until soft, cut stem and set aside, heat 1 cup water and boil mushroom until done, dip onto and set aside. 3. 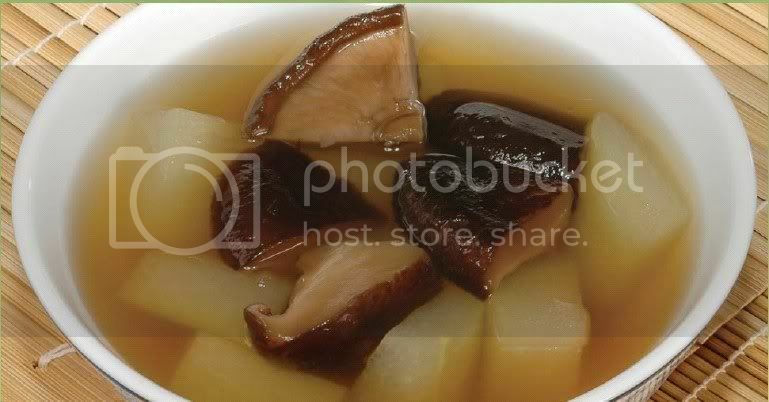 Boil soup stock, add wax gourd until fine, seasoning With light soy sauce, salt, pepper, add mushroom, remove from heat, dip onto cup and sprinkle with coriander, serve hot.